Modern OWL Tree Ornament Collection by NOVA68. Special: $49.99 instead of $60.00. Ornaments range is size between 3 and 6 inches diameter. Please allow 1 week for ornaments to arrive since they are made-to-order for us at a small glass workshop. Price includes complimentary shipping within the US with USPS Priority Mail. We do ship international for a nominal fee. Price is for 3 ornaments: receive 1 of each style as pictured. 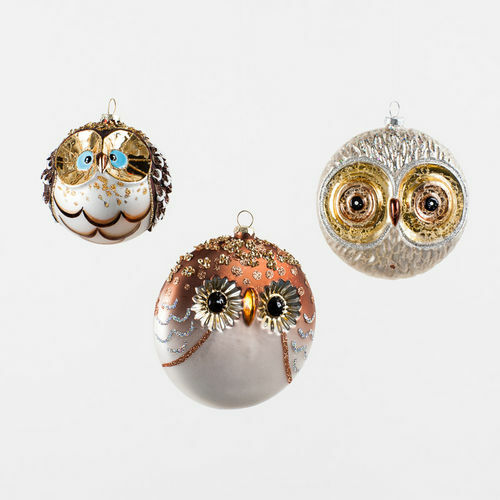 Rare handcrafted, hand decorated, sparkle and glass Owl Ball Ornaments with wonderful earth-tone colors and unique gold plated accents inspired by Japanese holiday decorations from the 1950s. This stylish and fun Owl Christmas Ornaments are a hoot! The set of 3 in various sizes and colors nicely compliment one another. Purchase a single set of 3 owls or use them in multiples for a spectacular display on any Christmas Tree. Retro Japanese Style Owl Ball Ornaments.